A few days ago, I was browsing through my blog postings just to see what I have been making for the past 3 years, I realized that I never posted Galbi, the Korean BBQ Ribs, recipes. You can’t talk about Korean food without mentioning the famous Korean BBQ ribs (galbi, 갈비), right? So, how could I forget posting one? Oh, clumsy Holly! There are two types of galbi. One is the traditional style that chunk of rib meat is attached to the bone, then butterflied to lengthen, and marinated with the sauce. The other kind is the famous LA galbi, which the rib is cut across the bone thinly. 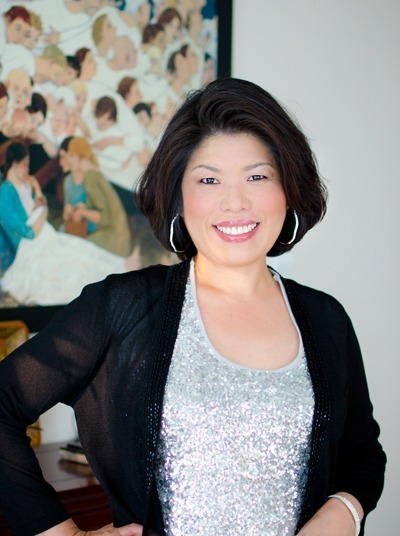 This American style cut is originated by Korean immigrants who lived in Los Angeles. Although there is another theory that the word, LA, might be the shortened word of lateral cut, most people believe that it means Los Angeles. 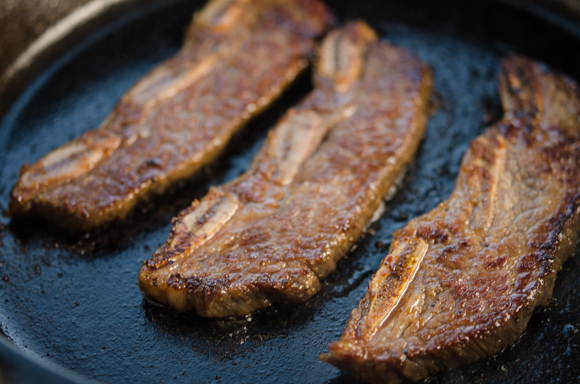 LA galbi is getting more popular due to its economic price and simpler preparation than traditional galbi. The most important part of preparing this succulent meat to the best depends on the quality of the meat itself and how to marinate them. I do have my favorite LA galbi recipe. 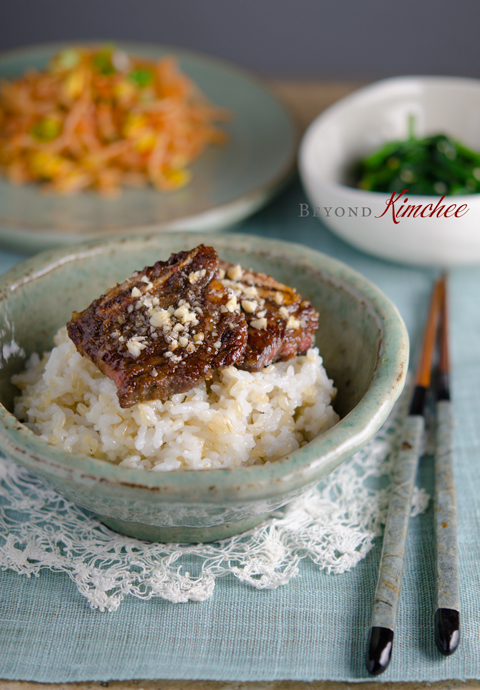 Actually I had been making my galbi in a slightly different way than this one, which I am going to share today, until a friend of mine tipped me with an exquisite way to prepare the meat a few years ago. 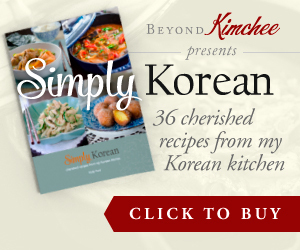 She learned it from a famous master cook in Korea where she took classes from. 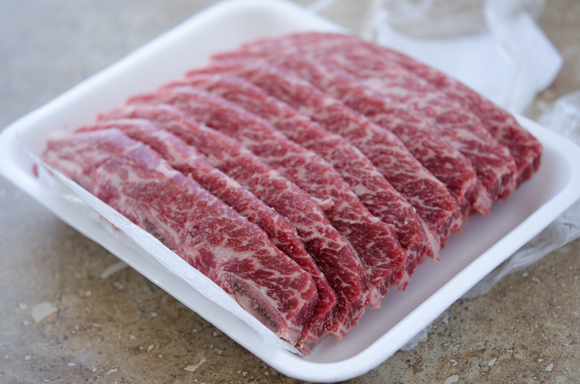 She kindly shared a great tip on how to prepare this mouthwatering beef. And I think you are very lucky to have this tutorial I am about to share. This is one of the best galbi I’ve made, and my kids think my galbi is far better than any restaurants they have been to. 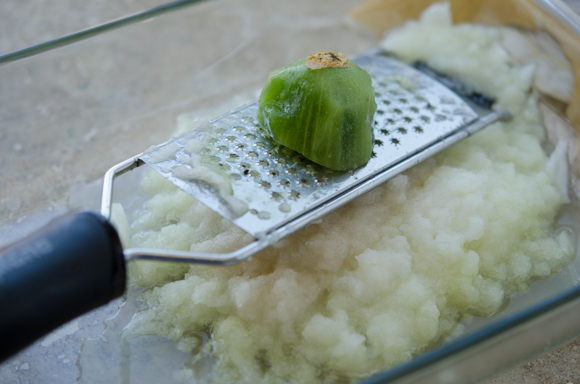 You can certainly use a blender to puree everything. That will make your life so much easier and tearless. and a tiny piece of kiwi. Remember! You only need a half kiwi. Too much will ruin the texture of the meat. Mix well in a shallow container. The 7″ x 11″ Pyrex pan would work the best. Here is the handsome LA beef ribs, about 1/4-inch thick slices. 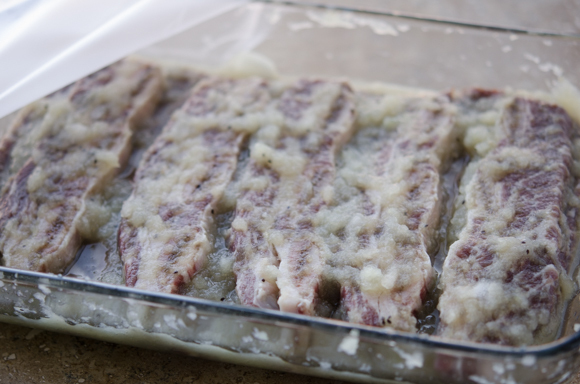 Spread the onion-pear-kiwi puree over the ribs coating evenly, and lay them flat in a pan. Cover with plastic wrap and let them sit in a room temperature for 45-60 minutes, or if you are concerned that your room temperature is too warm, chill in the fridge for 2 hours. This is the first marinade step. 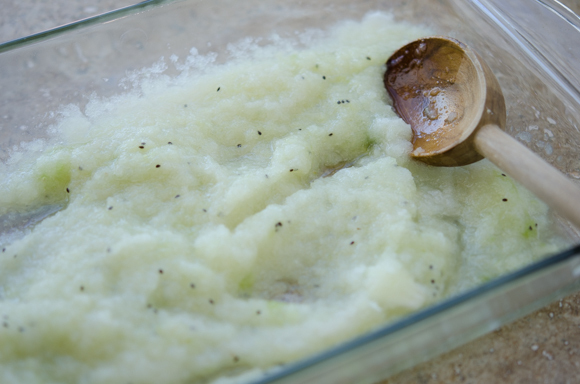 The onion-pear-kiwi puree will add a great flavor and tenderize the meat dramatically. But, you are going to scrape the most of the puree off the ribs though. They did accomplish their duty and we don’t need them anymore. This is the main difference from this recipe to the rest of others. It makes a significant difference in overall flavor and texture of the meat later on. Grab another 7″ x 11″ pan or wash the one you used to marinade the ribs, wipe clean. Pour soy sauce and a little Korean soy sauce for soup. 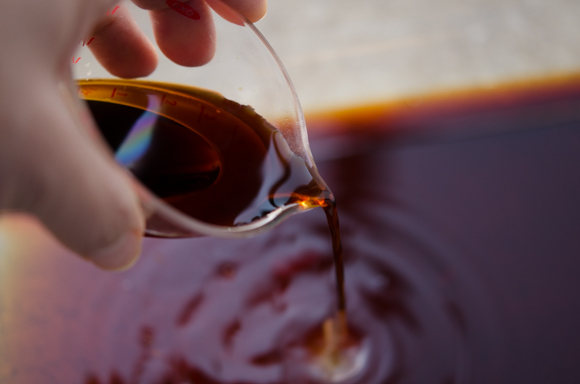 Combining these two types of soy sauce will result in exquisite flavor. Add brown sugar, garlic powder, pureed ginger, freshly ground black pepper, plum extract (or rice wine, if using), and sesame oil. Mix well. Return the ribs back to the pan and coat with the sauce evenly. Cover and marinade them for at least 4 hours in the fridge. Overnight is even better. Make sure you turn the ribs to the other side halfway during the marinating time. The marinading is over. Let them sit for 15 minutes in a room temperature before you land them to the grill or hot skillet. 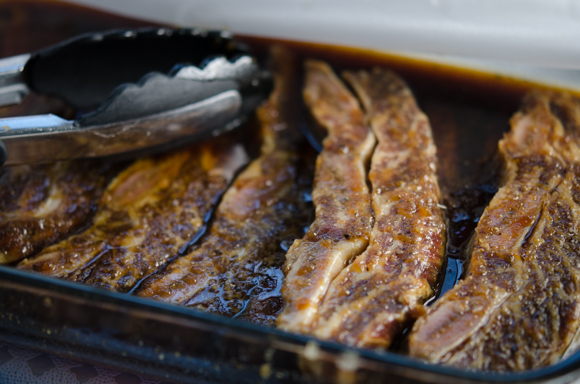 Cooking your ribs on a BBQ grill would be the best, but you can certainly cook them in a skillet, too. Heat the skillet over medium heat and lay your ribs. Oh, the sizzling! I can just hear the sound by looking at this picture. Cook for 2-3 minutes. Make sure you don’t burn them. Flip to the other side and continue to cook for another 2 minutes or so, depends on how you want your ribs to be done. I like to sprinkle a little chopped pine nuts or walnuts on my galbi. It makes your ribs look so elegant! Oh, the succulence…, the juiciness…, and the tenderness…! You can chew the meat off the bone and savor with rice. 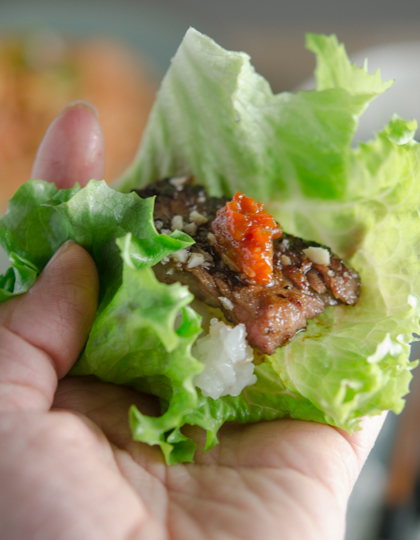 Or wrap with lettuce and a dollop of Korean topping sauce (ssamjang, 쌈장). I think everyone should have a feast every once in a while just to celebrate the way we are. With this ribs, the feast is on! You will love them and lick through the bones. 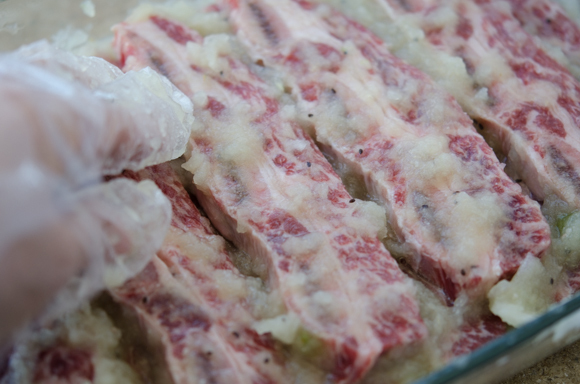 Mix grated onion, pear, and kiwi in a shallow pan (7x11 pyrex pan works great), layer the beef ribs and coat with the puree evenly all over. Cover and let them sit in a room temperature for 45-60 minutes or 2 hours in the fridge. 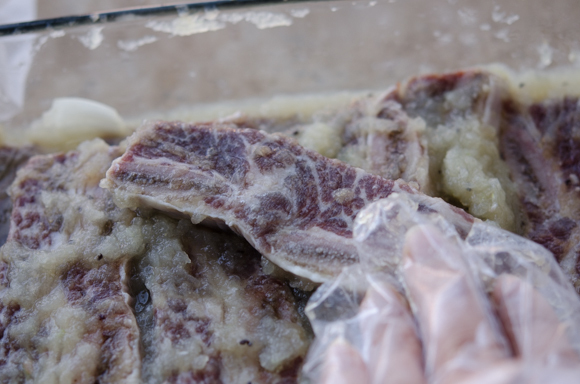 Remove the ribs from the puree marinade and scrape the most puree mixture off the ribs. Set aside. 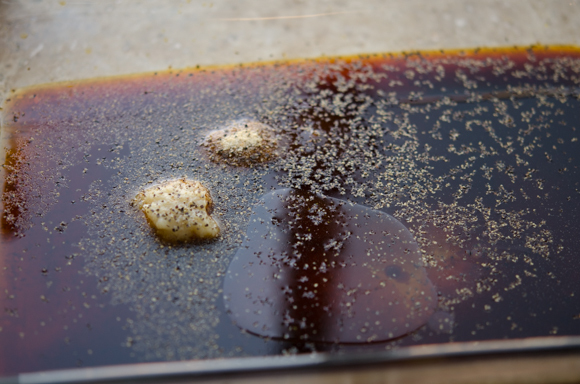 Combine soy sauce, Korean soy sauce for soup, brown sugar, garlic powder, ginger, sesame oil, pepper and Korean corn syrup (if using) in a shallow pan. Mix well. Return the ribs to the soy sauce marinade and coat evenly with the marinade. Cover and chill in the fridge for 4 hours at least or overnight. 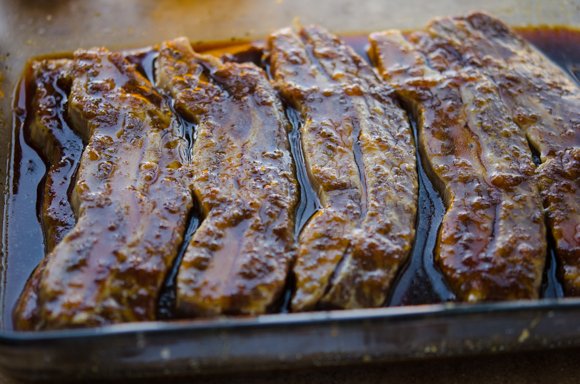 When ready to cook, let the ribs to sit on a room temperature for 15 minutes. Heat grill or skillet over medium heat, place ribs and cook 2-3 minutes on each side or until they are done for your liking. Serve hot with rice. Holly, is this an upscale recipe? 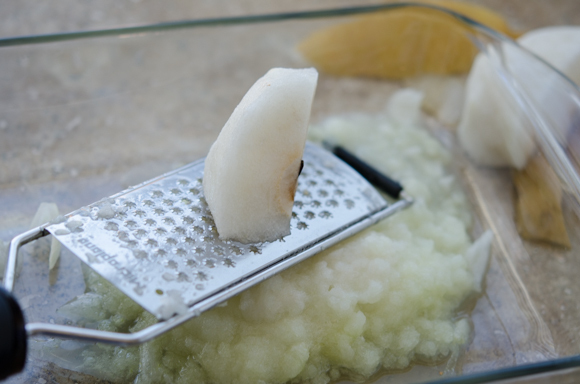 I don't remember my grandparents using Asian pear or grating an onion... if so, it seems that the pear adds a fresher taste to the marinade? Hi Chris Yes, you can call it upscale recipe/ Marinading the ribs in grated onion-pear-kiwi mixture first before you add the soy sauce mixture will tenderize the meat beautifully without the fibers from the onion and the fruit, which creates the clean aftertaste. You will like this recipe. Hello. Thank you for your great recipes and blog. My family and I really enjoy it. I have a very big family and I am wondering if I just use four times the amount of all the ingredients if I want to marinate 10 pounds of meat. Hi Ellen Yes, you can use 4 times of the recipe if you want to use 10 lbs of meat. Hope your family would like it. Wow, what a great dish! This looks wonderful -- it must be so full of flavor. Thanks so much. I've used a very similar recipe from my Korean mother-in-law for the last couple of years, but I've never done the two individual marinade steps (and I only had one kind of soy sauce). I always just put everything in the blender. Maybe I'll try those two changes and see if it makes a difference! Thanks for the insight. Holly, this sounds like a great recipe, I cannot wait to try. May I ask please, what is the difference between regular soy sauce and Korean soy sauce? Do you really need both kinds? Wow, it's definitely prepared in a different way to my typical method. I'm sure to try this out. So looking forward to it! Thanks for sharing your tips, Holly! I grew up in Southern California, and when I moved to New York I was shocked to discover that the galbi I'd been eating my whole life was actually not Korean, but Korean American. 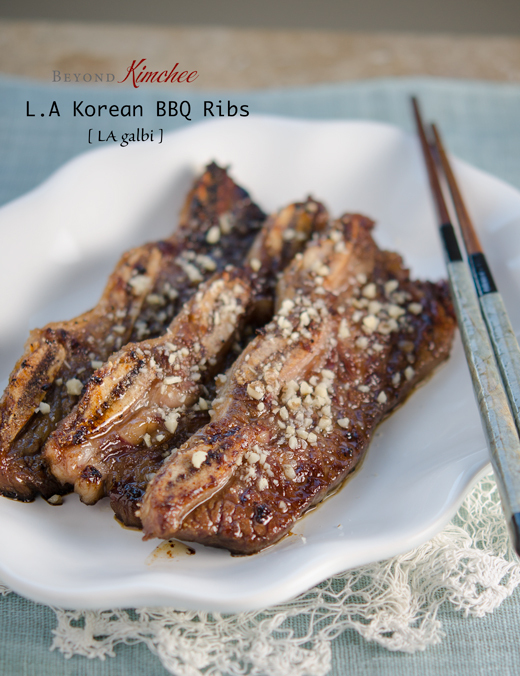 I'm so happy to see a food writer actually recognize L.A. galbi as a homegrown invention. p.s. My mom has always done Asian pear and kiwi, but she uses garlic instead of onion. You are the first Korean cook I have seen use gukgangjang with meat. For people who are gluten-free, this is their best soy option but many Korean chefs will tell them "You can only use soup soy sauce with soup. It's too delicate for meat." You are awesome! Hi Holly, Thanks for stopping by my blog earlier. Fab pics and yummy recipes. My OH would love these. This is such a rich and delicious recipe. I have wanted to make it since you posted it. I made it tonight for dinner and it is absolutely superb! I like it with rice and kimchee. My husband prefers the traditional way of eating it with doenjang on a lettuce leaf. I hope your readers try this type of galbi, it is fabulous. Thanks, as always for great recipes! I am so glad to hear that you and your husband loved this Galbi recipe, Nancy. Thanks for your sweet comment. You are making me crave my galbi again. I am going to try this recipe. 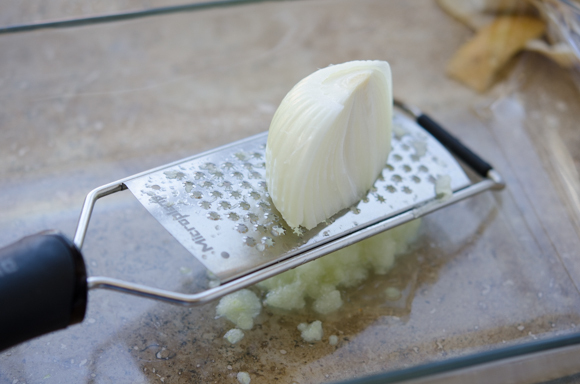 I would like to use fresh garlic instead of powder. Can you tell me what amount I would have to use? Thanks!! Hi Katherine Of course you can use fresh garlic. I would say about 2 cloves of garlic if using fresh. Hope you like this recipe! Thanks. Can you help me? I noticed this was categorized under gluten free. Is it really? I can buy tamari for the soy sauce. Not familiar with korean soy sauce. Hi Lenette, Korean soy sauce for soup is made of 100% soy. I checked the label of my bottle and I don't see any wheat product written on it. It is different that most soy sauce. Hello, In the recipe instructions, you mention the optional addition of Korean corn syrup but you don't list the quantity or purpose for this ingredient. Thanks in advance for you help and for this awesome recipe! Hi Susan I didn't put Korean corn syrup in the recipe neither in the recipe instruction. Did you see it in a different recipe by chance? Oh, I see now. I meant to write the Korean plum extract, but instead I wrote the corn syrup. My apology! Please disregard the corn syrup. No, your computer is not wonky, I think I am getting wonky with aging... haha! It looks beautiful, all the steps are clear, and sounds better than others. Every recipe asks for a 24 hour marinate, but fruits and onion and sesame oil add a lot of acid and deteriorate the meat texture in 24 hours. Great. I will try and let you know the outcome with Turkish beef. If I triple the amount of meat and adjust the recipe accordingly, would it ruin the dish if I did 1.5 kiwi also (based on the ratio)? Or would that be too much kiwi? I think 1 small kiwi will be all you need. Even though you triple the recipe, kiwi doesn't have to be. Hope you enjoy the galbi. Happy cooking! 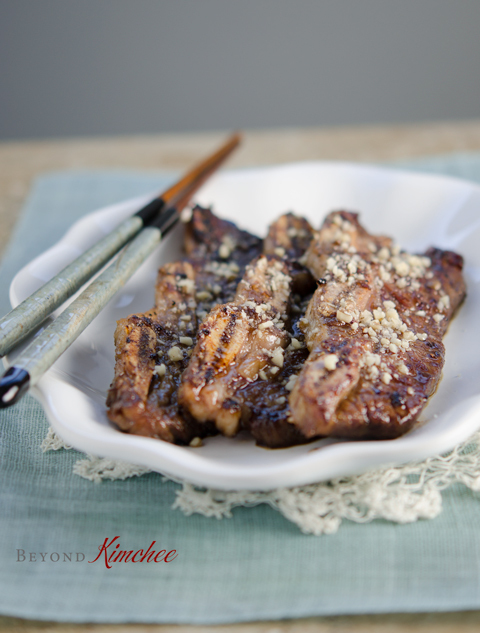 I can't wait to try this recipe as I've been in search of a Kalbi recipe that differs from my own. A lot of recipes call for soaking the ribs in cold water first. May I ask if you do that as well? I always worry that it will dry out the meat. 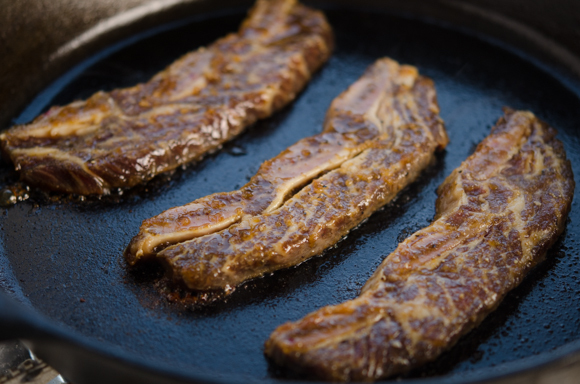 You don't need to soak the ribs in the water for Galbi making. Soaking is good for bone-marrows or other type of braised dishes. 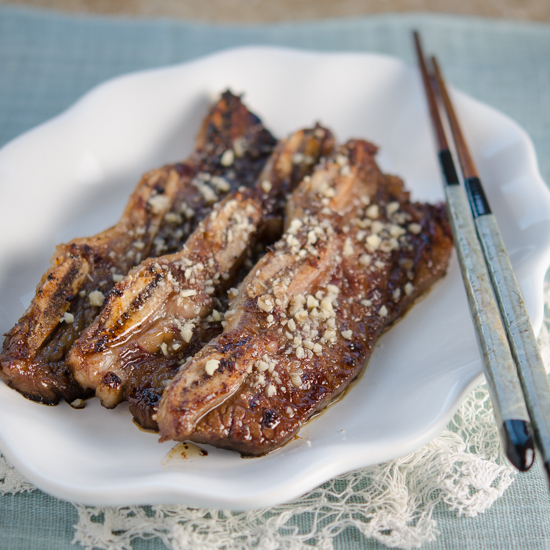 Hope you enjoy this galbi recipe. Good luck! Hi Terese, I am glad to hear that you want to try my recipe. If you want to cook this in the oven, I would recommend to broil. Hope you enjoy! Thanks. Hi Sharon, I am glad to hear that. This is one recipe I cherish and it makes me happy that someone else got a great result, too. Thank you. you can try for 2 hours, but at least 4 hours of marination will bring a better result.